Division rivalries are always fun, especially when you’re on the better half of it. Right now, the Texas Legends (11-20) are on that better half against the Austin Spurs (14-16). Dating back to last season, the Legends have won six of seven against their Southwest Division foe, including all three matchups so far this season. Texas used a 27-15 second quarter advantage to down San Antonio’s affiliate 111-103. 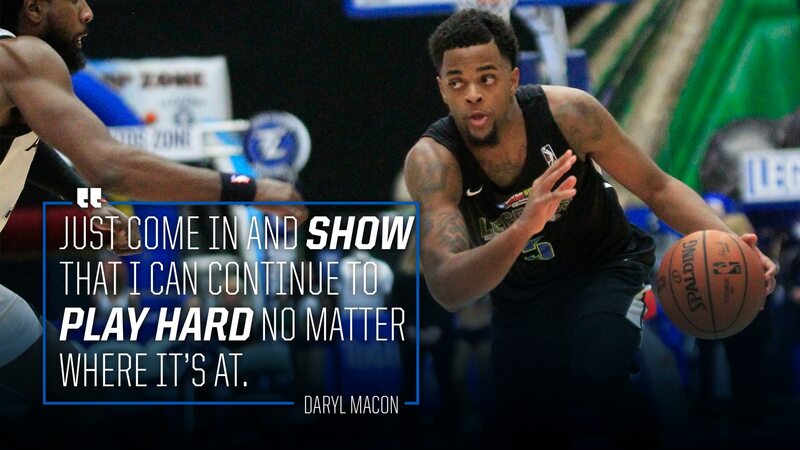 Returning from a trip with the parent club Dallas Mavericks, two-way rookie Daryl Macon played sixth man for a night, channeling his inner-Jason Terry and scoring 25 points. He went to the free throw line 14 times and didn’t miss. Macon played in his second NBA game last Saturday night at Indiana and recorded his first two NBA points. Joining Macon in the offensive explosion Wednesday was Portland Trail Blazers assignee Gary Trent Jr. After scoring 24 points in his Legends debut, Trent Jr. scored 33 more against Austin and also was perfect in big numbers at the charity stripe, hitting all 12 of his free throws. Ray Spalding met his nightly double-double quota, scoring 15 points and grabbing 14 rebounds (six offensive) for his 12th double-double of the season and his fourth straight. Most impressive of all were his seven blocks, a season-high for him and the team. Xavier Johnson started again and rewarded coach Bob MacKinnon with 10 rebounds, his seventh consecutive game with at least eight boards. Keith Hornsby scored 17 points and joined in on the rebounding fun, pulling down a season-high seven off the glass. Kostas Antetokounmpo added nine points and six rebounds off the bench. The other Xavier, the very versatile Rathan-Mayes, slid over to point guard after starting back-to-back games at small forward. He had 11 points and five assists, tying Macon’s passing total for the team lead. Macon was with the big club for four games, totaling eight on the year, and returned to the G League with more valuable NBA experience under his belt. The Legends shot 48 free throws –making 37 (81 percent)– and shoot just under 27 attempts per game, top five in the G League. Since winning game number 200 of coach MacKinnon’s career, Texas has won three of four and will look to keep things rolling Friday night as they wrap up a three-game home stand against the Northern Arizona Suns (6-25) at 7:30 PM CT.